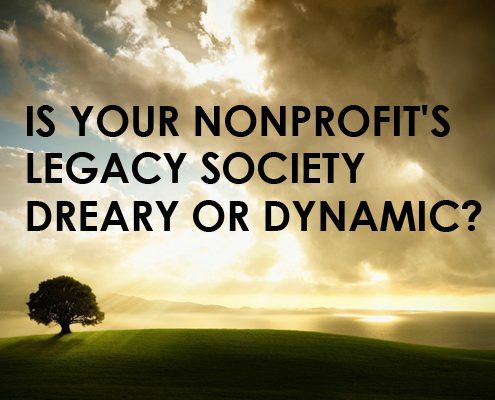 Is Your Nonprofit’s Legacy Society Dreary . . . or Dynamic? 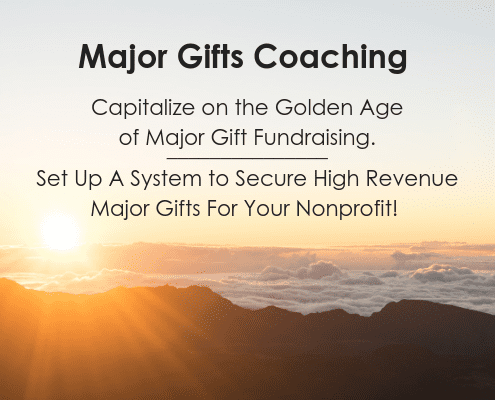 Most organizations have a gift club or society for keeping contact with those very special planned giving donors. In April, be sure to join our Planned Giving Intensive to help you establish a constant flow of generous, bequest gifts to your nonprofit. One of our fab presenters is the very smart Claire Meyerhoff, President of The Planned Giving Agency, LLC. She’s my go-to person for planned giving marketing and communications. Here’s her guest post with her best tips to jazz up your legacy society. Your Legacy Society is a great planned giving marketing tool. Flip to the back of your annual report. Do you list donors at various levels? And are your “Legacy Society” donors at the very end? Who are they? They’re leaving a gift in their will to your nonprofit when they pass away. Oh, dear! That sounds VERY DREARY! 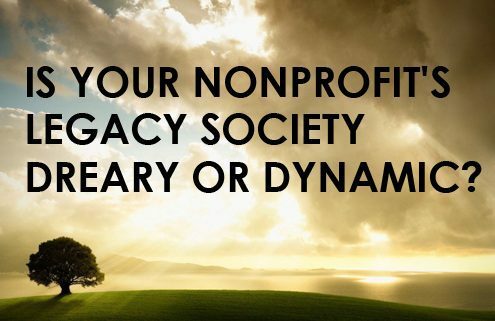 Your legacy society donors and prospective donors are NOT dreary. 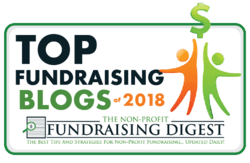 In my ten years as a planned giving marketing specialist, I’ve interviewed dozens of donors, sometimes in long conversations lasting up to two hours. They’ve told me wonderful stories about why they care enough to make a special (and significant) charitable gift like a bequest. Do you want MORE of these wonderful donors? More bequest intentions, outright gifts of stock, IRA rollover gifts, gifts from life insurance and retirement plans, charitable trusts, etc? Then, raise the profile of your Legacy Society. If you do, let’s humanize and raise the profile of your legacy society. Think of it in terms of marketing and promotion– not just a stewardship vessel. One of the least expensive ways of “planned giving marketing” is to take a dreary legacy society and make it more dynamic. Naming a charity in your will or creating another type of charitable plan is something many “everyday philanthropists” do. It’s a social norm. Here are FIVE IDEAS to help you get some attention with your legacy society – and they’re all very budget-friendly. 1. Share Lovely Donor Stories. Your planned giving donors have a story to tell – they’re making a gift of a lifetime – but WHY? With your legacy society branding prominently featured, put their story on your website, social media, in your newsletter and in direct mail pieces. Henry loved hiking the trails near his home, and while recovering from heart surgery, he ventured back – a little bit each day. While hiking, he thought about what mattered most, then named the Trail Conservancy in his will. The story features a professional photo of hiking Henry and the title “These Trails Gave me Life,” not the waste-of-space headline “Donor Profile.” (You can find more donor story tips and great resources here. 2. Promote Your Legacy Society at Events. With a great photo of a donor “in action,” like hiking Henry, make a stand-up display with photo, caption, society logo and URL. At your auction, golf tournament, reunion, etc. set up a table, hosted by a board member, and offer a tasty treat – like fancy cake pops. You can even give out a simple info-piece like an “Advisor Guide” for prospective planned giving donors to share with their attorney and accountant. 3. Give Your Legacy Society a Cool Name. If it’s already called “Legacy Society,” that’s fine. But if you don’t have much invested (letterhead, recognition wall, engraved gifts), consider a new name with personality. One of my first clients was Pearl S. Buck International and we changed the dormant “Visionary Society” into “The Camellia Circle,” named for Pearl S. Buck’s favorite flower. Think about this: tasking a few board members with coming up with a new name is a great way to start the planned giving conversation. Some say “the pin just sits in a drawer.” From a marketing standpoint, I think it’s what you do with the pin. At a volunteer recognition luncheon, the Pearl S. Buck development director presented the first, newly designed Camellia Circle pin to a volunteer/planned giving donor in front of a roomful of prospective donors. Nice. Also, a pin is great for marketing content. If you work for dog rescue charity, snap a photo of a dog “presenting” a legacy pin to a planned giving donor for Facebook and your newsletter. Don’t have a pin? Ask a local artist to design one and promote the story on social media, your newsletter and other communications platforms. 5. A Pocket Pal: Legacy Society Invitation and Giving Guide. My client Kent Weimer at Kent Weimer of Parkland Foundation (the charitable arm of Parkland Hospital in Dallas), and I did a direct-mail piece inviting donors to join the 1894 Society. We designed a new “leave behind” for his suit jacket pocket. Now, Kent has a gracious invitation to offer supporters. It includes ways-to-give ideas and the information a professional advisor need to help carry out a planned gift (sample bequest language, Tax ID, Kent’s contact info, etc.). We call it “the pocket pal” and Kent loves this friendly, welcoming charitable planning guide. 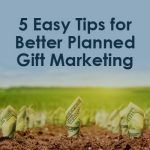 No matter where you are in “the planned giving game,” you can do a few things today that will help bring in awesome gifts tomorrow. And to me, as a marketing specialist, your legacy society is the best place to start. 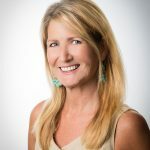 Claire Meyerhoff is a nationally recognized nonprofit communications consultant who specializes in helping philanthropy professionals with marketing and stewardship projects. She started The Planned Giving Agency, LLC after years of success working with well known planned giving marketing firms. 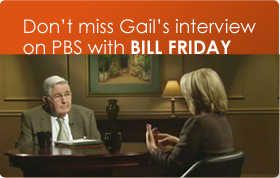 As a former broadcast journalist, Claire brings a unique and fresh perspective to the charitable sector. 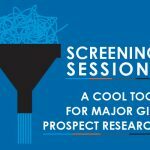 Based in Washington, DC and Raleigh, NC, Claire presents at conferences and to local AFP and gift planning groups. Learn more about her presentations and workshops here. https://www.gailperry.com/wp-content/uploads/2018/03/3-30-18-blog-image.jpg 400 495 Gail Perry https://www.gailperry.com/wp-content/uploads/2016/03/Fired-Up-Horizontal-300.png Gail Perry2018-03-30 09:52:192018-03-30 18:19:32Is Your Nonprofit's Legacy Society Dreary . . . or Dynamic?